More is not always better. This is definitely true when it comes to men’s disposable razors (or cartridge razors). Fancy 3-blade, 4-blade, and 5-blade razors are tempting to use – because we’re led to believe that quantity equals quality. It’s easy to think that more blades makes for a better razor, but this isn’t really true. Those multi-blade razors that seem so full of promise are really just a waste of money. At best, multi-blade razors will get you the same close shave as their single-bladed counterparts. At worst, they’ll get ruined much faster. Cheap single-blade disposable razors are better than multi-blade disposable razors. The biggest reason – aside from the cost – is the fact that multi-blade razors tend to keep getting clogged with hair, rendering them useless long before the blades become dull. This has been known for decades, but razor manufacturers (and their paid celebrity endorsers) have done a wonderful job convincing us to invest in multi-blade razors — and fancier ones too… that swivel, spring, and glide across your skin — for a better shave. In reality, more blades don’t give you a better shave. If you want the truth… a single blade razor known as a safety razor gives the best results of all. And it’s the most affordable option too! Multi-blade razors don’t give a closer or smoother shave – all they do is allow you to shave more hair off in one direction than you could with a single-blade razor. That’s convenient and all. But keep in mind that it’s much harder to clean a razor that has 2 or more blades. Since the blades are close together with extremely small spacing between each cutting edge, hair gets bunched up under and between the blades. It’s very difficult trying to rinse or pick the hair out of a multi-blade razor. To top it all off, if you shave fairly often the hair buildup is more likely to render your razor useless and you’ll have to toss it after only a few uses. It’s not that the blades get dull – they just get clogged. And it’s expensive to keep buying all of those replacement razor cartridges! For some reason, nobody seems to have figured out how to safely clean the hair out of a multi-blade razor. With all the multi-blade disposable razors on the market these days, you’d think they would have invented a handy gadget to clean them by now. But for now, the only solution is to buy more razor blade refill cartridges. Here are some other disadvantages of using a multi-blade razor. Single-blade razors require you to do the shave-and-rinse process more often – since you can only make so much progress in a single swipe with one blade. However, a single-blade razor is far less likely to clog because there aren’t lots of little nooks & crannies for hair to get stuck in – like there are with multi-blade razors. So you can actually shave for longer periods of time when using a single-blade razor. Clearly, I’m not saying that single-blade disposable razors will last forever. But they do last longer than multi-blade razors – due to the simple fact that hair doesn’t get trapped in them as easily. 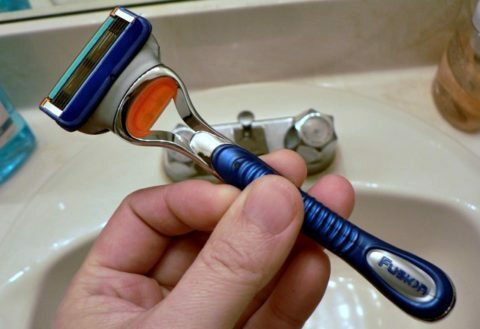 In terms of cost, both types of disposable razors are often sold in bulk . But you usually get more single-blade razors per package than multi-blade ones, and they’re almost always cheaper too. Still, your best best for longterm use is to get a safety razor and be done with it. Safety razor blades cost only pennies apiece, and you’ll be getting the closest shave possible. So… don’t be fooled by the expensive, multi-blade razors. They look promising, but they’ll get clogged and ruined long before a simple single-blade razor will. By the way, the same is true for women’s disposable razors as well. 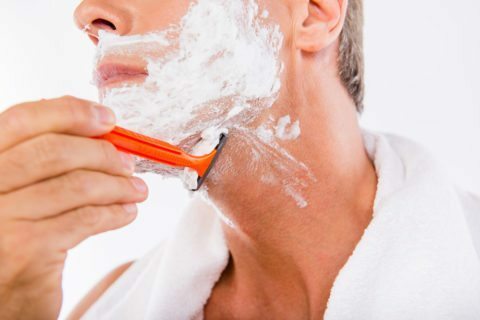 You can save yourself a bunch of money just by taking a little more time with your typical shaving routine to get the most from a single-blade disposable razor. Do you know how to properly shave? It took me a few tries to get it right. #1 – For starters, the best way to clean a single-blade disposable razor is to run the razor under some water, and then run it over a towel a couple times. The result will be a clean, empty razor that’s ready to continue helping you on your quest for smooth skin. #2 – The best advice for prolonging the life of any razor is to keep it perfectly dry until you use it again. #3 – Or… soak it in olive oil (inside a small glass) or rubbing alcohol to keep the blades from rusting and corroding when kept in a humid environment in between shaves.